Anytime an airline announces changes to their award program, the changes are usually worse than the airline tries to make them sound. 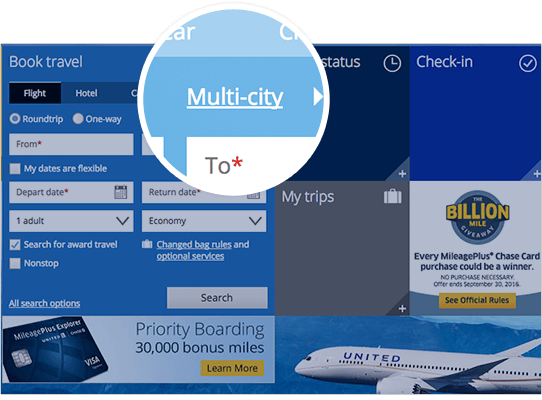 In August, United announced major changes to award booking rules as well as to their online booking engine. These changes became effective last week on October 6 and now that we have had some time to test out the new booking engine, we can confirm the devaluation is worse than expected and that United’s original announcement was a bit deceptive. This is a more comprehensive analysis of the rule changes when they were first announced. When using the old United award booking engine, complicated itineraries often could not be booked online, but it was possible to piece them together leg by leg using multiple searches. Once you had the entire itinerary worked out, you could call in and feed the details to a United agent over the phone. As long as you stayed within the routing rules the award would price out correctly, and usually you could get the phone booking fee waived by informing the agent that it was impossible to book the award online. Under the new system, we are totally dependent on the award booking engine to show us results that meet our needs. The only way to book an award ticket for the proper number of miles is if you can get the itinerary to show up in a standard round-trip or one-way search. You can often find better routings by using the multi-city search tool, however if you use this under the new system the award price will be calculated on a leg-by-leg basis. So even though you have followed all of United’s routing rules, the award will price out more expensive than it should based on the award chart. If you use the multi-city search tool under the new system, the award price will be calculated on a leg by leg basis. They sure used an awful lot of language in an attempt to put a positive spin on these changes, but the bottom line is that we are now dependent on United’s award booking engine, which doesn’t pull in all partner flights, excludes many routings, and has a difficult time with itineraries of three or more legs. The other sad part about all of this is that United phone agents do not have the ability to manually override award prices anymore, meaning the old fallback option of feeding an itinerary over the phone is gone. Let’s suppose that we want to find a saver business class award to Bangkok from the U.S. We’ll start from Houston since it’s a United hub in the center of the country and do a search for September 2, 2017 since it’s near the very end of the currently released flight calendar. We did a standard one-way search for a flight from IAH to BKK. 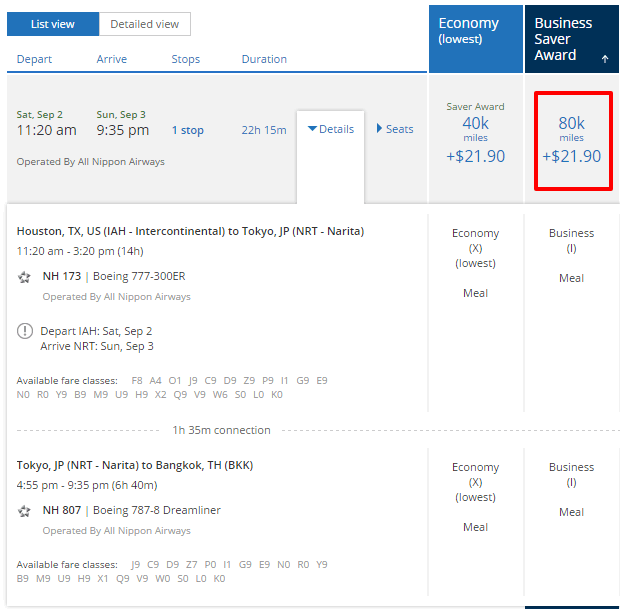 When we sort the Business Saver Award column, the shortest itinerary is a flight with only one layover from IAH to NRT to BKK with both segments on All Nippon Airways, which is a very nice airline. As you can see in the red box, the award prices out properly at 80K miles. So far, so good. However, many of us are not lucky enough to live in an international gateway city. What happens if we need a domestic connection in order to set ourselves up for international portion of the trip? Let’s assume that we live in the Cincinnati area. 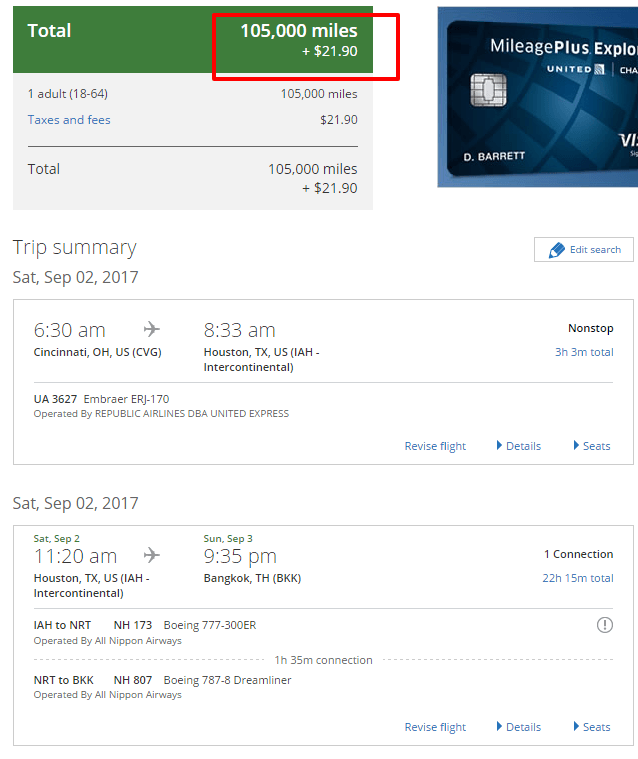 United has 4 daily nonstop flights from CVG to IAH, so there should be a good chance to find a connecting flight. If we try a search for the same date from CVG to BKK, the routing option above does not appear in the results. Perhaps there is no domestic connection on that day that arrives in time to get on the 11:20 AM ANA flight? 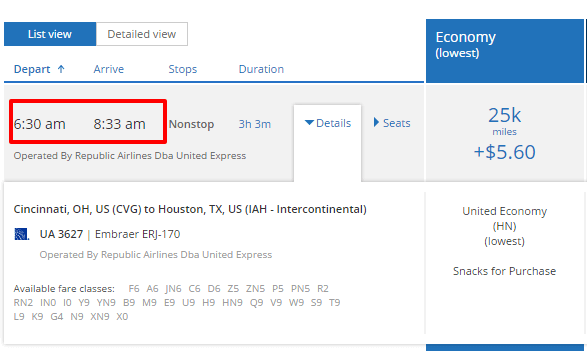 If we do a one-way search from CVG to IAH we see a flight available that arrives at 8:33 AM in Houston. This leaves us with plenty of time to get on the ANA flight to Tokyo. So we should be able to add this leg onto the original itinerary and create a three leg flight that still costs 80K miles since we are still departing from the same region. In order to find this itinerary, we use the multi-city search tool and search the first segment from CVG to IAH and the second segment from IAH to BKK. Sure enough, the award booking engine shows the exact same flights that we found previously, but now the total cost is 105K miles! United is adding the 25K miles required for a domestic economy standard award (apparently no saver awards are available on the CVG to IAH flight) to the 80K miles required for a business class saver award to Bangkok. Suffice it to say that this is a significant devaluation on the part of United, and many of us will be forced to choose between undesirable routings or higher award flight costs in the future.